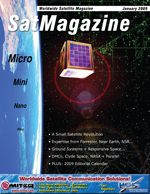 Home >> January 2009 Edition >> INSIGHT: SatellitesBigger Or Smaller? Yes! INSIGHT: SatellitesBigger Or Smaller? Yes! On September 6th, a powerful new geospatial imaging system, the GeoEye-1, was launched from Californias Vandenberg Air Force Base. Only a week earlier, on August 29th, the RapidEye constellation of five satellites blasted off from Baikonur, Kazakhstan, to form the newest entry into the commercial, multispectral, remote sensing market. The contrasts were striking indeed. Each of the RapidEye sats is less than a tenth of the size (by mass) of the GeoEye system  only 150 kg each. As has held true in the electronics industry, is smaller the future of satellites as well? It is always a pleasure to see a successful launch of new space-based services. We offer our congratulations to all players involved. One particularly proud participant in all of this should be Surrey Satellite Technology Limited (SSTL), the U.K.-based organization that built the highly compact buses for the RapidEye constellation. Having grown out of a university project in the early 80s, SSTL has been a force in the development of small satellites for the last two decades, pushing the limits in satellite size and capability in dozens of systems. Along the way, many fellow travelers have joined them  enthusiasm for building satellites as small as a single kilo has exploded among academic institutions, in scientific missions, and even in military circles. A small satellite can now be built for a few million dollars each  compare that to the standard quarter-billion dollar telecom sat. The idea of building low-cost satellite systems assembled on rapid schedules appears to be an economically attractive one. On the other hand, commercial space systems have been less likely to trend towards smaller and, in fact, have been going directly in the other path. Commercial telecom satellites have been growing ever larger, due to increased demands for ever larger and more powerful antennas, more transponders and spot beams, and more power from larger arrays of solar panels. Telecom satellites routinely weigh in at over 5 metric tons and some now weigh over 6 metric tons. Soon-to-be-launched mobile services satellite Terrestar-1, with a record 20-meter deployable antenna, will weigh in at about 6700 kg  more than almost any other commercial satellite ever launched. If there is an economic argument for going small, the commercial market certainly has other ideas. Some of this is the inevitable result of engineering requirements emanating from market demand. Telecom satellites are getting bigger because consumers demand smaller handsets and more bandwidth. Physical constraints demand that nothing less than bigger satellites to satisfy that requirement. Remote sensing sats, such as GeoEye-1, are also getting bigger as higher resolutions demand larger aperture sizes. The argument can go the other way, as well. RapidEye, for instance, trades resolution for faster revisit times and greater coverage. The Company positions itself as the conduit for clients who need more dynamic demand, such as for weather events, natural disasters, and seasonal land use surveying. Another small satellite system, Orbcomm, focuses exclusively on low data-rate machine to machine (M2M) communication, a market that argues for the low capital cost of deploying small satellites. How do small and large satellite systems measure up economically for their sponsoring businesses? So far, direct comparisons between small satellites and their larger brethren are hard to come by in direct commercial markets. The chart at the top of this page compares the most recent example. Both the RapidEye constellation and GeoEye-1 had roughly equivalent costs, with both having a degree of government participation. Are the five sats of RapidEye the rough equivalent of one GeoEye-1? The market will tell the story. A possible comparison would be the various competing mobile satellite systems deployed in the mid-90s. The chart below compares the first generation Orbcomm and Iridium systems with the Inmarsat-3 satellite system, all launched within a few years of one another. Subscribers are based on the most recently available data. Revenues and EBITDA are annualized for 2008, based on the most recently available information. Readers should note that Inmarsat financial numbers reflect the operation of the newer Inmarsat-4 system. Of the three, Orbcomm was certainly the least expensive to build out, but its limitations to low data rate communications has meant that it must overcome much lower average revenue per user (ARPU) than its competitors. Iridium and Inmarsat were much more expensive systems, yet garner far more revenues due to their increased capabilities in voice and high data rate communications. They also have positive EBITDA, an indicator of maturing companies. On the other hand, Iridium can boast a model few businesses can  after the original company went bust on low subscriber growth buried under huge capital costs, private investors bought the whole system for $25 million. When you can get that kind of a deal, who needs small satellites? Where do we go from here? Will new technologies allow small satellite systems to gain the capabilities of larger systems? Will the business case to go smaller be compelling? The biggest element to watch will be not so much be the size of the satellite, but the functions they will serve and the potential for the opening of new markets. What systems will be used to finally bring mobile satellite communications to regular handsets? What systems will be used to deliver high-resolution real-time earth imaging around the globe, or to provide robust technology demonstration services? Will they be big or small? Yes.